I noticed that when I am in plane mode, when I haven't got any network connection, I can't receive any GPS position. As soon as I turn on network, GPS works great. I did some tests yesterday, and I figured out that it was my phone which had some problems. In fact, I wanted to use TomTom or navigon without data transfer. It firstly didn't work, until I did a Soft Reset! This corrected the problem, and now it is possible for me to catch GPS Signals wihout having any WiFi or 3g/Edge connexion. Cell phone GPSs - and I assume the iPhone implements it the same way - aren't "real" GPS devices. A standalone GPS does two things: receives time codes from multiple satellites, then does a complex series of calculations to convert that information into a position fix. The signal reception part is easy; the calculations are computationally intensive. In order to conserve battery power and space, cell phones only do the first part. They receive the raw time code signals, then relay them to a server maintained by your phone company. The server crunches the numbers, figures out the cell phone's location, and relays that back to your phone. If you're not on the network, your cell phone's GPS won't work. the plane would also act as a faraday shield and block a large amount of the signal. Ok, this explains the non-GPS ability for the plane mode. In fact, is GPS working without a Data Plan ? 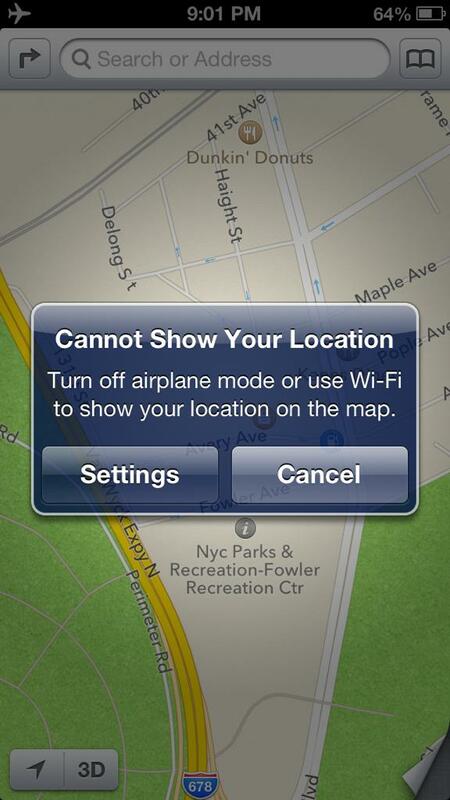 You can get a GPS fix in flight mode. The chances are that you're trying to get a location inside a plane which will block the GPS fix (as planes act like Faraday cages. Nothing in the iPhone's software actually prevents you getting a fix. The chances are, if you get a GPS lock outside the aircraft, then keep it next to the window while in filght, that it will maintain a GPS lock OK (getting a lock is harder for a GPS than maintaining one it already has). Therefore Alan's answer is not correct. Feel free to beg. It won't change the answer. And it's not like it will take more than 2 minutes to test for yourself.